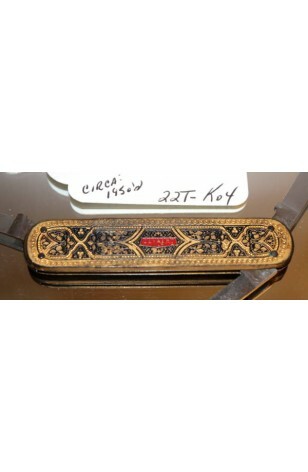 Vintage - Swiss Schleuniger Solingen, Brass Handled, Steel Blades, Folding, Pocket Knife with Brass Handle. The Knife has both Large and Small Steel Blades, as well as a Pair of Scissors. The Brass Neilo Handle is Highly Carved. Folded Size is Approximately 3" Long, and 1" Wide when Closed. The Knife has both Large and Small Steel Blades, as well as a Pair of Scissors. The Brass Neilo Handle is Highly Carved. Folded Size is Approximately 3" Long, and 1" Wide when Closed. Good Resale Condition as viewed.